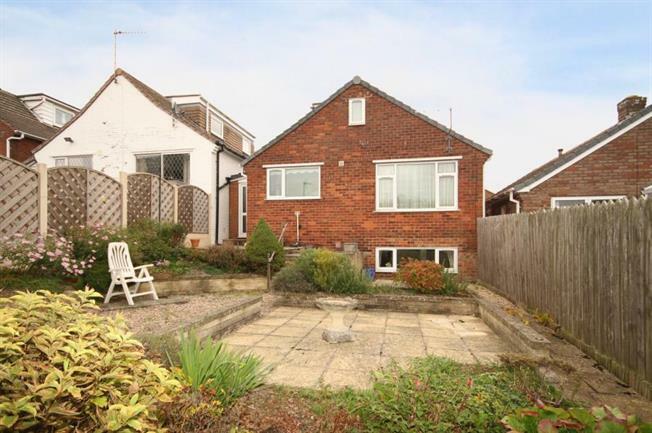 3 Bedroom Detached House For Sale in Dronfield for Guide Price £280,000. A unique property which must be viewed to appreciate the deceptive size and versatility on offer with this split level three/four bedroom detached house. Formerly a detached bungalow the previous owners have significantly altered the lay out to create a house with accommodation set across three floors. Requiring a scheme of modernisation and alteration this property would potentially appeal to those with a dependent relative who requires their own space whilst remaining part of the family unit. Entering at the ground floor level the accommodation comprises of a kitchen with a range of matching wall and base units with worktop over. A spacious lounge which looks over the rear garden. You also find two single bedrooms one of which has plumbing for a sink and toilet. These two rooms could potentially be knocked through in to one to create a nice master bedroom with en-suite. To the lower ground floor you see a continuation of the potential with another double bedroom with en-suite bathroom comprising of sink, toilet and bath with shower over. This level also offers potential to be further converted to create an independent living space for a teenager or elderly relative. To the attic level you will find a double bedroom with dormer window and another bathroom made up of a four piece suite including a part sunken bath, walk in shower, sink and toilet. Outside you have parking for two cars to the front of the house and to the rear you have a low maintenance garden with a raised patio area which makes the most of the far reaching views to the rear of the property. Coal Aston has a number of local amenities such as shops, schools, doctors and good public transport links to the surrounding areas. You are also a short journey from Dronfield where you find a train station which makes commuting to Sheffield, Chesterfield and further afield much more convenient.